What’s better? Using sunblock that may have cancer-causing ingredients or not wearing it and risking burns and melanoma (AKA skin cancer)? Researchers and experts are divided on the subject of what exactly is safe sun protection. 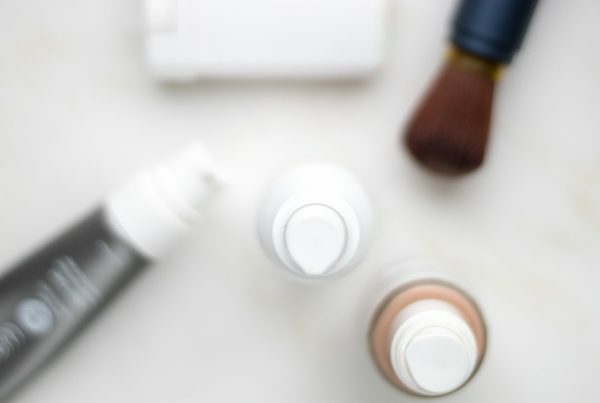 Chemical sunblock is certainly a no-no when it comes to being “green”, but many of the “natural” sunscreen products on today’s market have hazardous ingredients buried in their formulations which negatively react to UV rays. Let’s examine both ends of the sun block spectrum. First, the “purists” believe the sun itself makes what’s in most sunscreens cancerous. Are you thinking you must have read that wrong? Nope, you didn’t. The purists rely on research that shows the majority of the active and inactive ingredients in sunscreen are quite risky when exposed to the sun. Instead of using sunblock, purists espouse eating foods and using skin care loaded with anti-oxidants, and covering up with clothes and hats as the only safe way to be in the sun. Read more about Vitamin E in the Sun: A Natural Skin Armor on how food can be a natural sun protection. Make sure you aren’t stripping natural oils, AKA your built-in sun protectors, from your skin during your daily cleansing routine. Only use a gentle cleanser for the face and body that is free of sodium lauryl sulfate. The other side of the sunblock spectrum are the “protectionists” who believe the sun’s rays are too damaging, especially with our thinning ozone, to take the risk of being without sunscreen. Which kind of natural sunblock should you use? Natural mineral sunscreens, such as zinc oxide and titanium dioxide, are considered the safest because they physically block both UVA and UVB rays. Whereas chemicals are so minute that they can really be absorbed by the skin and interfere with proper cell functioning. Many say that zinc oxide is preferred because it blocks UVA and UVB rays better and is typically less reactive in formulation with exposure to sun than titanium dioxide. The drawback of mineral sunblock is how white and thick it is upon application. Quite a few brands are using technology to make a clear titanium dioxide and have refined the textures to being lighter and less gummy. But wait…that technology is also controversial. Some companies are using nanoparticles in their formulations of mineral sunblocks. These are of great concern because nanoparticles are small enough to easily be absorbed by the dermal layer of the skin. Then they can penetrate the cells and when exposed to sunlight, cause photocatalysis within the cell, leading to DNA damage. (Powell, et. al. 1996). “Nanoscale zinc oxide and titanium dioxide were detected in all but one of the six US-marketed mineral-based sunscreen products tested by Consumer Reports in 2008 and all 10 mineral-based sunscreens tested in 2007,” reports Friends of the Earth. Without labeling regulations, the consumer has no way to know if she/he is buying a product that has nanoparticle (also called micronized) sizes of titanium dioxide or zinc oxide. Without solid, conclusive research many governments (including the U.S. Food and Drug Administration) aren’t making any strong moves to protect the consumer through labeling or restrictions. The Environmental Working Group recommends the use of nanosized mineral sunscreens over chemical sunscreens which is a source for much debate among the purists and protectionists. For now you’ll have to defer to your gut instinct and the brand for honesty on the nano matter. If you see one of the active ingredients in your sunblock starts with an “O”, put the bottle down! Those are the most dangerous chemical sunscreens we know of for humans and sea life. Oxybenzone: photoalleric reaction, is very easily absorbed into the skin and the Center for Disease control says it’s a contaminate in 97% of Americans. Covering up too much prevents our bodies from absorbing the sun’s rays; sunlight helps manufacture vitamin D, an essential nutrient for the body, which boosts our immune system and energy stores to function at an optimal level. Doctors say we need at least 15 minutes of sunshine per day of to be in good health where vitamin D is concerned. Tolerance for sunshine depends on how deeply pigmented the skin is. Someone with very fair skin can’t tolerate extended exposure to direct light without risking burns, premature aging and development of melanoma. A darker complexion already has within its pigmentation much more melanin that filters out the absorption of UV rays. If you are using any treatment topically or internally with a Vitamin A derivative, like Retinin A or Accutane, skin is particularly vulnerable and the sun’s rays can be especially damaging. Knowing that, it seems unbelievable that some sunscreens actually contain retinyl palmitate, “a form of vitamin A that might actually speed the development of skin tumors on sun-exposed skin,” reports the Environmental Working Group. As a world-traveling makeup artist I often found myself spending weeks (shooting from sun up to sun down) in sunny spots like the south of Italy, the Caribbean and Mexico. Being a fair-skinned gal who worshiped the sun too much in her youth at the beach, it’s important now not only to protect from burning, but also not to reinforce all the sun damage of the past. Curious to see which natural sunscreens I love most? What everyone can agree on is that covering up and avoiding long exposure to direct sunlight from the hours of 11am-3pm is the safest way to protect from sun damage in all its forms. Given your skin’s history and your lifestyle, it’s up to you to decide what your best method for sun protection is. This is a great article, and I notice that now it’s a few years old, and if you have any updates about new sunscreen products that perhaps have come on more recently. I do love the EWG resource for toxicity information, but I also appreciate your take on the subjective elements of a sunscreen.